The UN Migration Pact, officially named the Global Compact for Safe, Orderly and Regular Migration, represents a catastrophic dismantling of key components of democratic institutions by the United Nations, a body that has increasingly allied with the Organization of Islamic Cooperation (OIC). The drafting process for the Pact began in 2015 when all 193 member nations met and adopted a declaration stating that no individual nation could manage international migration alone – that it required a global effort under the United Nation’s domain. In 2017 President Trump pulled us out of the Pact because “numerous provisions… were inconsistent with U.S. immigration and refugee policies.” In December of 2018, only 164 nations officially signed the Pact. Proponents claim Trump was over reacting because a Pact is not a legally binding agreement like a treaty but, legal experts suggest that it was written in such a way that it created a legal framework like other UN Compacts that have been used by lawyers to interpret the meaning of law in individual nations. The problems with the UN Global Compact for Migration (GCM) are numerous. The very first sentence states that signers of the Pact will be “reaffirming” the New York Declaration for Refugees and Migrants. So what exactly are they reaffirming? Among the Declaration’s many assertions are the claims of the “rights” of children of “migrants” to full welfare and education benefits, food, housing, and health care which includes sexual and reproductive health. Signers are also promising to comply with the Convention on the Rights of the Child which not only destroys parental rights but requires the “registration” of all births into an international database. Equally troubling is the Declaration’s call for hate crime and hate speech legislation to stamp out expressions of opposition to immigrants using international law to accomplish it. In addition the Declaration requires that large movements of refugees and migrants must have policy support, assistance and protection consistent with international law; such assistance to include food, shelter, psychosocial support and health care etc. If the very first sentence doesn’t send chills down your spine, the second sentence of the Global Pact mentions a long list of U.N. Pacts and Covenants that signatories must take into consideration up to and including the U.N. Framework Convention on Climate Change, i.e. Agenda 2030. According to Major Russ Cooper, cofounder of the group Canadian Citizens for Charter Rights and Freedoms, in addition to the affirming the NY Declaration, nations that sign the Pact must agree to end poverty and social inequity; remove any distinction between legal and illegal immigrants, expand migration by allowing reunification programs, eliminate all forms of discrimination and dissent to immigration, place restrictions on the media to ensure they are “sensitive” and “educated” in all matters pertaining to migration, and submit themselves to international law. Essentially it’s a globalist masterplan for making migration far too easy and not the kind of migration you might approve of. It is the kind of migration most us dread – the one where hordes of mostly unskilled, sometimes criminally deviant males of fighting age descend on our county – at best to overburden our infrastructure and exploit our overgenerous welfare systems, and at worst – to destroy us from within. The globalist political elite doesn’t respect sovereignty, nor does they give a damn about the views of ordinary people. That’s why the Gilets Jaunes are setting France ablaze; that’s why thousands of protestors are out on the streets of London following Tommy Robinson and the #BrexitBetrayalMarch; that’s why they elected Matteo Salvini in Italy, Viktor Orban in Hungary, Jair Bolsonaro in Brazil; that is why Donald Trump is president of the USA. We are living in an era of world revolution. 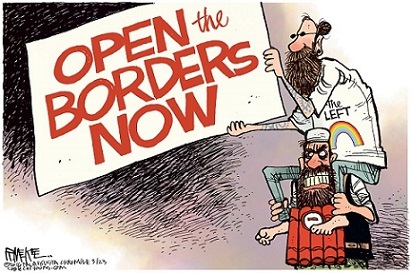 And the globalists, as embodied by the kind of George Soros financed left-wing groups that are pushing for open borders and a one world government, are on the wrong side of history.